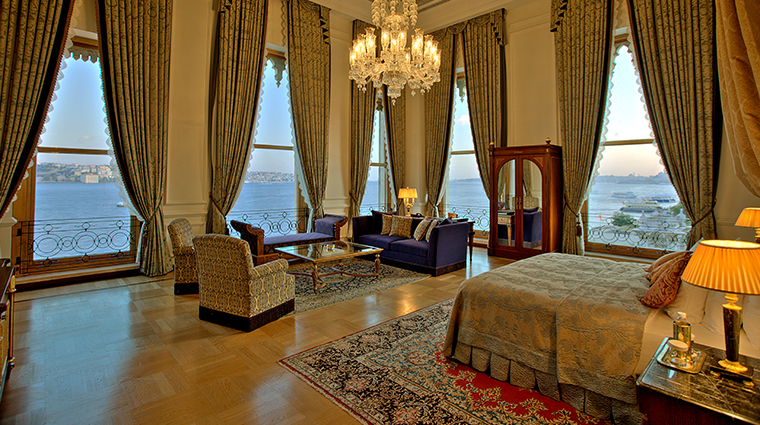 Çırağan Palace Kempinski Istanbul combines historical imperial grandeur with a spectacular location. 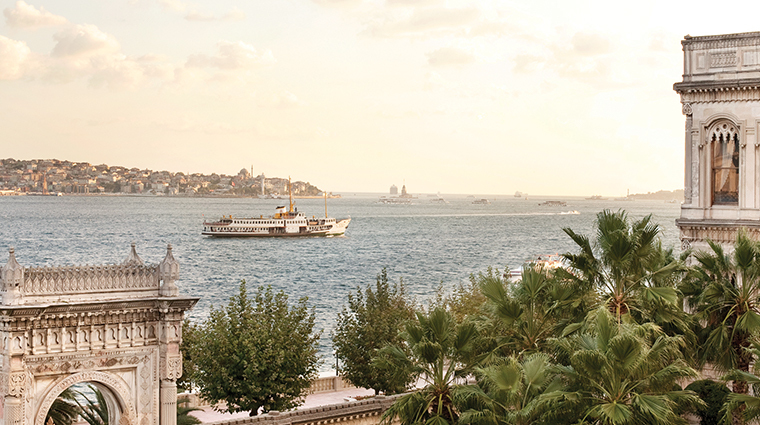 Formerly home to Ottoman sultans, the luxury hotel sits right on the shore of the Bosphorus, the scenic strait that divides Europe and Asia Minor. 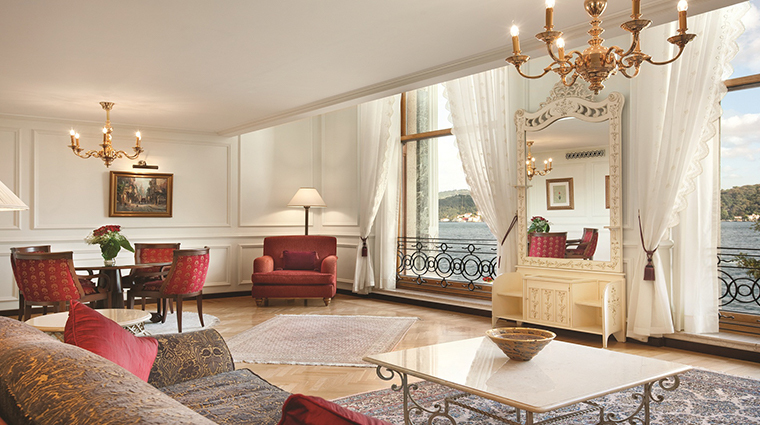 The property dwells in two grand buildings: a restored 19th-century Ottoman palace reserved for special suites and banquet facilities, and a modern annex housing the majority of the rooms, suites and restaurants. Situated right on the water, the garden has the grandest open area, stretching along nearly a mile of seafront. 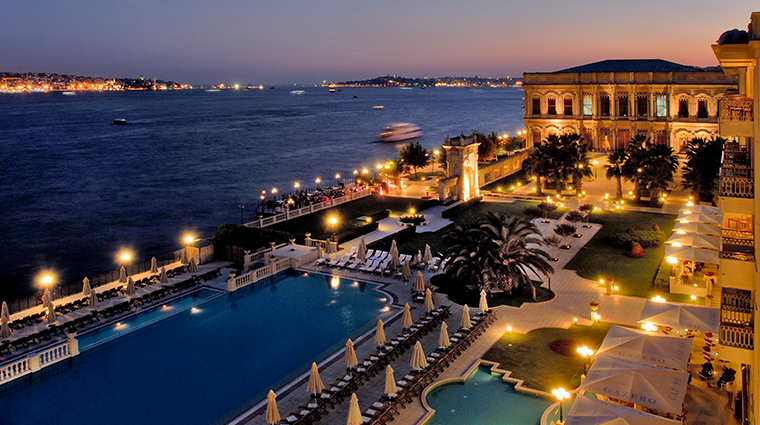 In this stunning setting, the hotel has a unique advantage — it is the only property in Istanbul that is accessible by private boat, by helicopter or by car, which makes it an in-demand spot to host exquisite events. Needless to say, it is the ultimate setting for weddings with its show-stopping backdrop, regal ambiance and air of exclusivity. 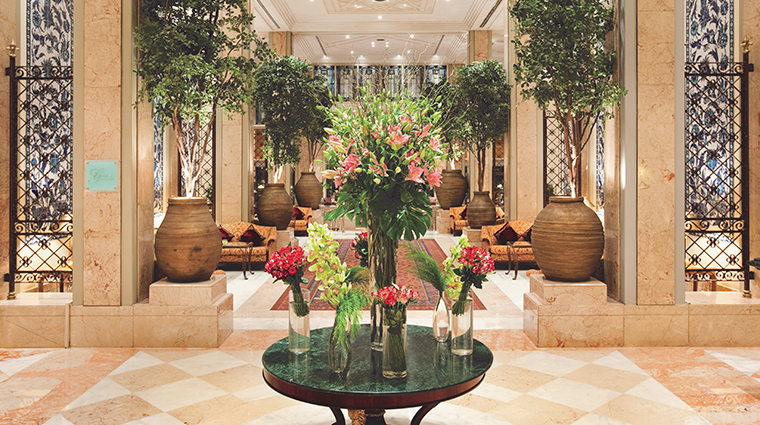 Decorated ostentatiously, the Istanbul hotel’s old-style interior architecture melds the two structures. The grandeur of the historic palace continues into the modern building with antique furniture, abundant velvet and satin upholstery, wooden paneling, ornate rugs and textiles and marble detailing. The heated outdoor infinity pool is a must-try experience any time of year, even if it’s snowing. 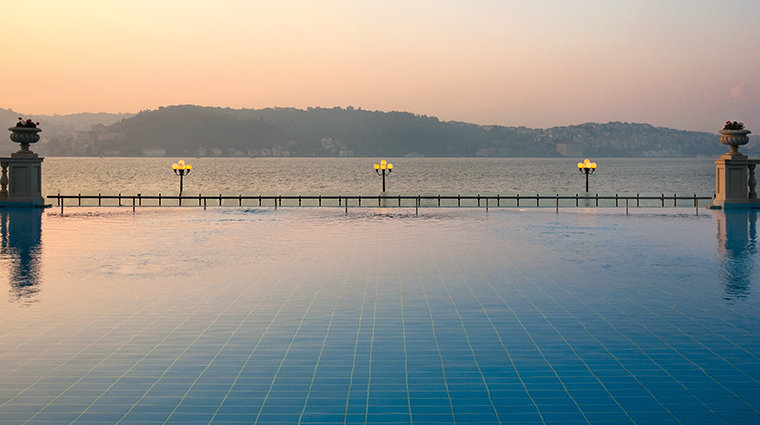 The edge of the water blends so seamlessly with the Bosphorus that you’ll feel as if you’re swimming right alongside the ferries and boats passing by just a few yards away. 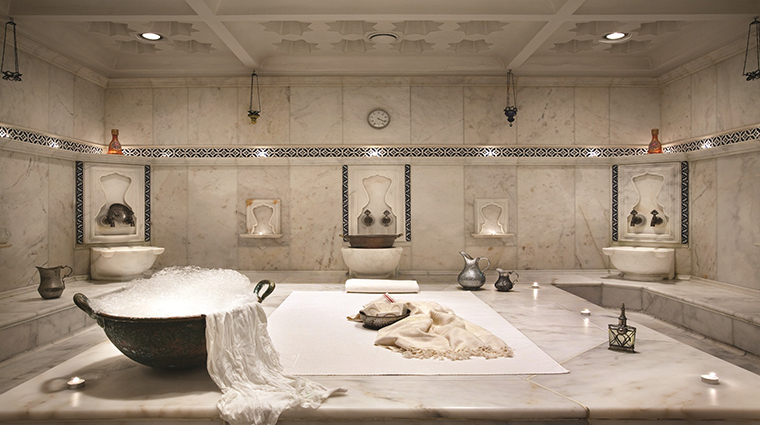 Get pampered at The Sanitas Spa & Wellness, which offers everything fromTurkish bath rituals to Ayurvedic massages. For an authentic local service, book the hammam. Though the name conjures up an image of a smoky, dim corner, Le Fumoir (the hotel’s hookah and cigar lounge) feels more like a palace courtyard with its open-air garden setting under swaying palm trees. It’s a pleasant spot for a nightcap, even if you don’t smoke. Check out the wall of fame to see the countless celebrities, royals and world leaders who have stayed here. Many famous guests praise the service — the experienced staff is, indeed, helpful and charming. Don’t miss a visit to the gorgeous and historic Yıldız Park, especially during tulip season in April. 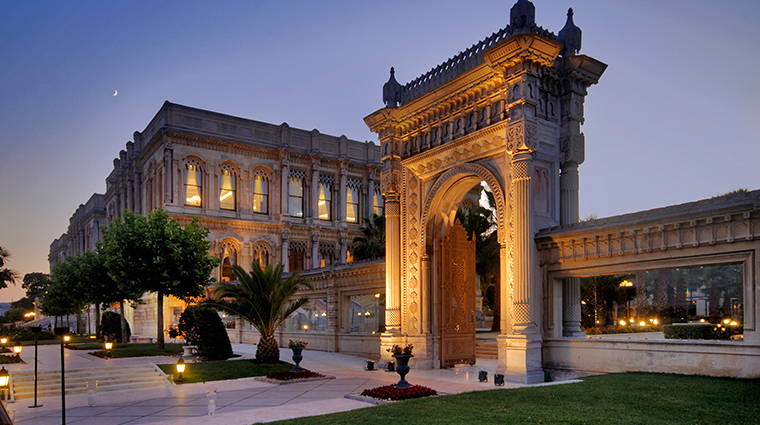 Situated at the back of the luxury hotel, the park was formerly the royal garden of the original Çırağan Palace. Keep in mind that the summer is the region’s high season for international travel, so nighttime river cruises and fireworks might cause some extra noise in the evenings — but that’s part of the fun in Istanbul. Be sure to try the baklava at the hotel. Çırağan Palace has its own baklava room with baklava masters who make only this jewel-in-the-crown sweet of Turkish cuisine. 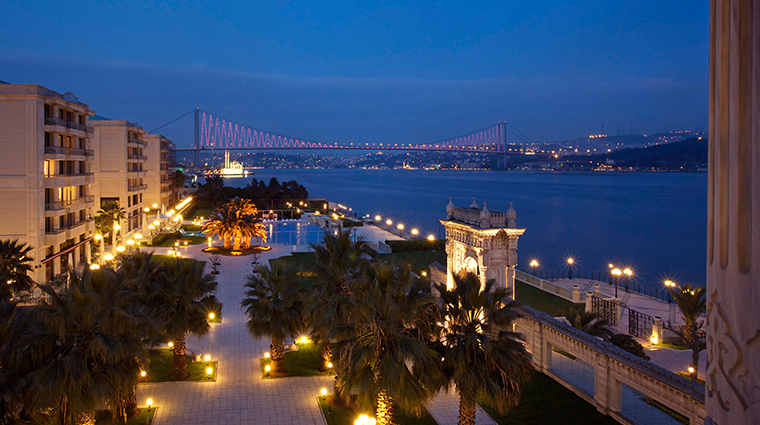 Linger longer when you take advantage of Ciragan Palace Kempinski Istanbul's new Timeless Check-In/Check-Out service. 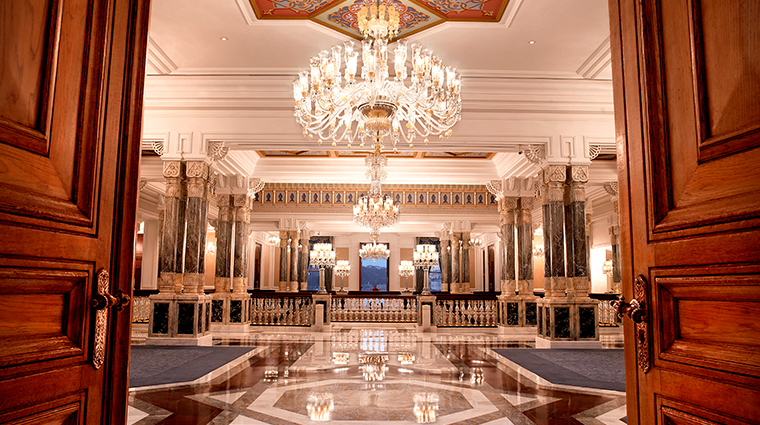 The posh property is the first hotel in Turkey to allow you to name your expected arrival — whenever you show, you'll be whisked up to your already-prepared accommodation as soon as you set foot in the palatial lobby. 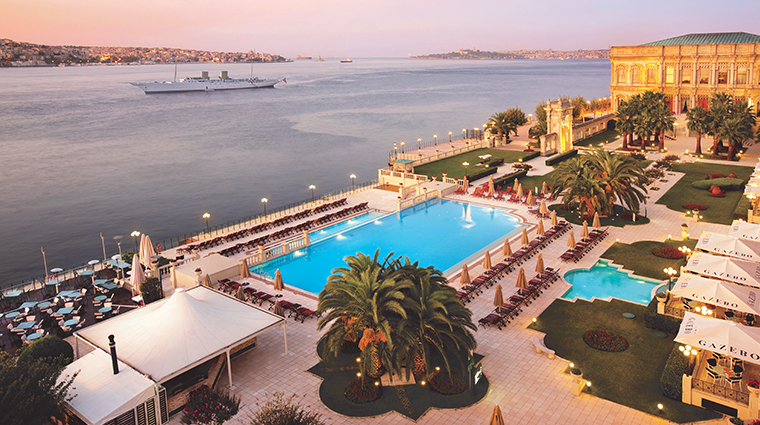 The majority of the Istanbul hotel’s 310 rooms are in the newer building, which features an E-shaped design to provide a sea view to most of the accommodations. All rooms in the new building have their own spacious balconies overlooking the water or the lush park. A small seating area makes it a delight to enjoy an alfresco pre-dinner or late-night drink. 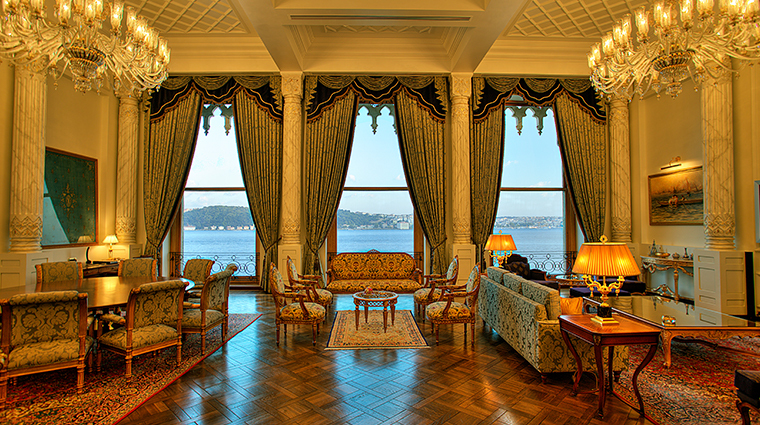 Çırağan Palace also offers 20 suites in the main hotel and 11 suites in the historical palace, all of which include 24-hour butler service. The most sumptuous stay can be found in the Sultan’s Suite, with a grandiose 4,930 square feet of regally decorated space. The amenities are generous. Marble-clad bathrooms come with Salvatore Ferragamo toiletries (Acqua di Parma items in the Sultan's Suite) and evoke a classic luxuriousness. Laledan Restaurant serves the famed Çırağan breakfast, a daily spread of more than 300 items, 80 percent of which are made with organic ingredients. The Sunday brunch at Laledan is as popular with the locals as it is with tourists, their kids all having fun in the next-door playroom. The sumptuous spread includes choices ranging from sushi and lamb cutlets with saffron rice, to French pastries and Turkish and Middle Eastern fare. Save room for the scrumptious morsels in the separate cool dessert and chocolate room. 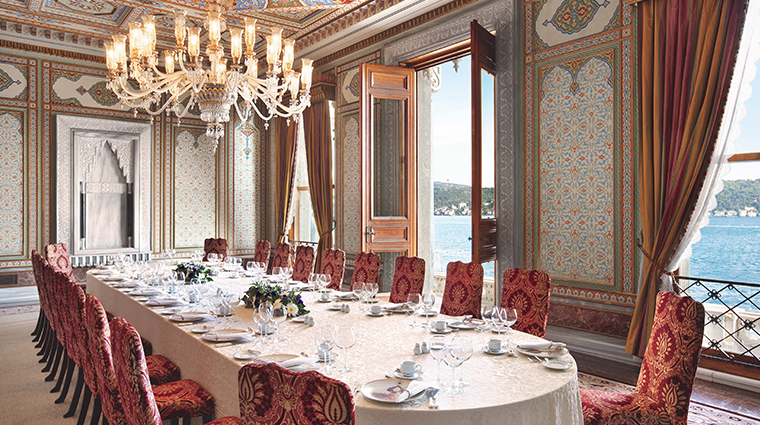 Entirely dedicated to Ottoman cuisine, Tuğra Restaurant is the star of the Çırağan Palace’s dining scene. 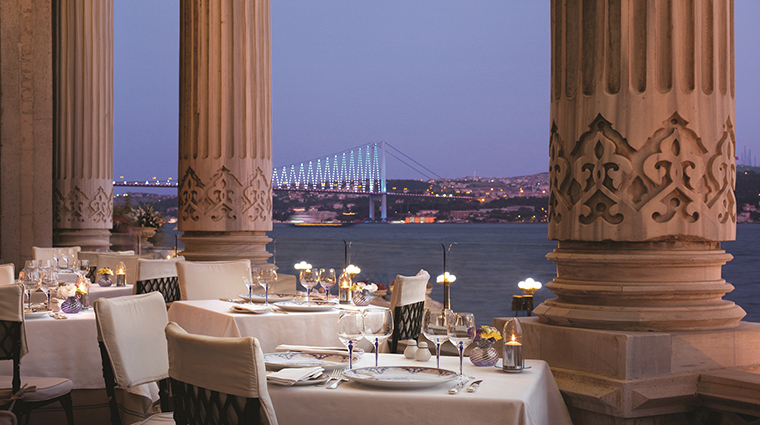 Executive chef Sezai Erdoğan constantly researches and expands his menu to include dishes found in archives of historic Turkish and Ottoman sites, such as coconut kadayif, a popular dessert served to palace visitors in the 1890s. 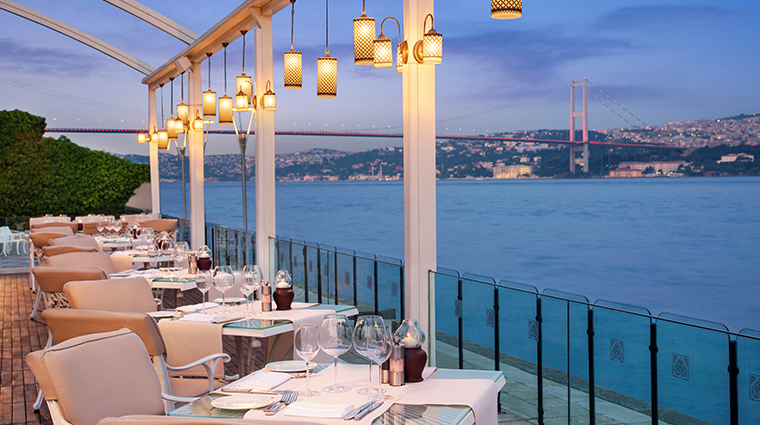 Open only during the summer, the pop-up Bosphorus Grill serves up wonderful barbecue, kebabs and fresh seafood for lunch and dinner right on the waterfront.